Move over, Google, Tesla, BMW et al: Nvidia is gearing up to build a self-driving car with Audi, and promises to have an autonomous vehicle on the road by 2020. 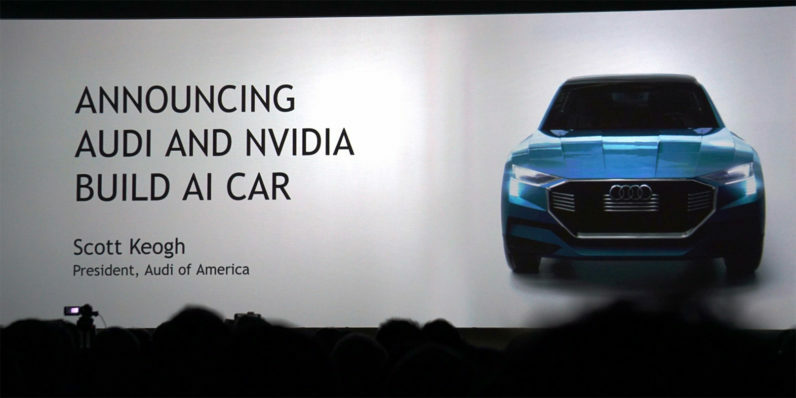 To that end, the company showed off an Audi Q7 at this year’s CES that’s capable of driving itself with just four days of training, thanks to Nvidia’s new Xavier AI supercomputer for cars. Originally revealed last September, Xavier is comprised of 512 GPU cores, a custom 8 core CPU architecture, and a new computer vision accelerator to allow it to deliver 20 trillion operations per second of performance. The processor maker has been working on self-driving tech for roughly a decade already, and has made huge strides since it started. At CES 2016, it announced the Drive PX2, a deep-learning platform for self-driving cars packed into a system with 12 CPU cores and four GPUs that are capable of delivering 8 teraflops of power. It also recently showed off its autonomous BB8 test car that learned to drive by mimicking humans behind the wheel. In addition, the company unveiled its AI Co-Pilot software assistant today, which uses data from sensors to build awareness of what’s happening inside and around the car – whether that’s a pedestrian up ahead or a biker behind your vehicle – so it can alert human drivers to react accordingly when they’re driving manually. Of course, Audi is hardly the only firm aiming to get autonomous cars on the road soon. BMW and Ford have their sights set on a 2021 launch; Google has spun off its autonomous vehicle tech efforts into a separate company, likely in the hopes of partnering with manufacturers to build vehicles with its tech baked in; Tesla has begun equipping all its new cars with plenty more hardware to enable self-driving functionality in the future. It’ll be interesting to see if Nvidia’s partnership can help Audi gain a lead over its rivals in bringing self-driving cars to the market.